Very friendly and easy to handle pets. Are very often docile and ready to play! Bearded dragons are very easy to handle and do not take much upkeep outside of the usual cleaning and feeding. They make great first pet reptiles. Yes! Bearded dragons are easy to keep up with, gentle, and can be kept in a small area. Adult dragons will require a minimum of a 20-gallon tank, but if your dragon is larger than most, it might require a larger tank. 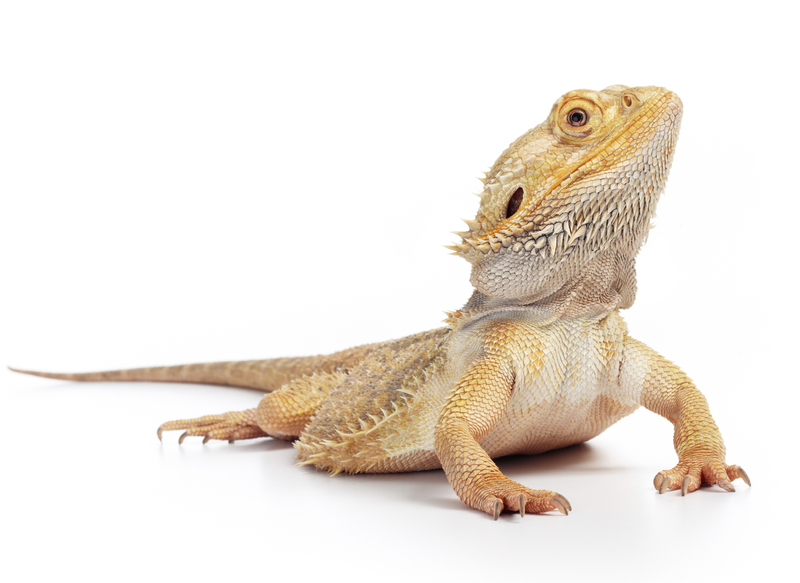 Bearded dragons can be expected to live upwards of eight years with a proper diet and health. Most dragons will get to be about 20" normally, but can, in rare cases, grow larger than that. Bearded dragons can live together when they are young, but adult beardeds, specifically male, need to be left alone. When it comes to other reptile species, you should not keep them in the same tank, as bacteria given off by one might be harmful to another. Bearded dragons are docile creatures and rarely bite. When they do it is under extreme stress or hostility, but otherwise they are very gentle and easy to handle reptiles. Natural sand is recommended. Bark, cypress and plastic liners can also be used. Bearded dragons spend a lot of time basking under a heating element. These branches can provide a number of basking areas. These rock-like bowls provide a natural look to any terrarium and are ideal for feeding and watering. Easy to clean and disinfect. Comes in corner bowls and other shapes. Can be used during the day to provide radiant heat and establish a daytime ETR. Use the chart on the side of the box to determine appropriate wattage. A nightlight bulb will help keep the bearded dragon from getting too cool at night. It is not healthy to leave daylight lights on at night; a 12-hour day and night cycle is needed for psychological benefits. A combination of digestible animal and plant sources which will provide your pet with the proper balance of essential nutrients. The only diet fortified with real crickets for you pet's dining pleasure. We have Bearded Dragon Diet for Adults and for Juveniles. We also sell Buffet Blend versions for both, which includes freeze-dried insects for more protein and other benefits: Adult Buffet Blend and Juvenile Buffet Blend.